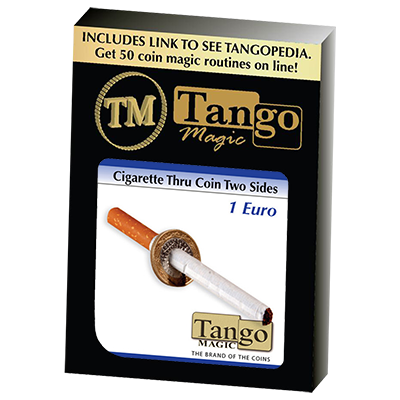 Produktinformationen "Zigarette durch 1Euro / Cigarette Thru Coin Two Sides 1 Euro by Tango Magic | Zaubertrick"
The magician takes a coin in his hand and penetrates it with a cigarette or a pen. In this package you will find a finely crafted gimmicked coin set produced by Tango Magic. Tango Magic produces the highest quality gimmicked coins in the world. Tango stands behind their products to guarantee your success. Weiterführende Links zu "Zigarette durch 1Euro / Cigarette Thru Coin Two Sides 1 Euro by Tango Magic | Zaubertrick"
Kundenbewertungen für "Zigarette durch 1Euro / Cigarette Thru Coin Two Sides 1 Euro by Tango Magic | Zaubertrick"
Abonnieren Sie den kostenlosen Newsletter und verpassen Sie keine Neuigkeit oder Aktion mehr von Zaubershop für Zauberartikel Zaubertricks und Zauberzubehör.